April is the best season to admire the flowers of the genus Rhododendron in Kunming Botanical Garden (KBG). In this garden there are more than 43000 plants of Rhododendron, belonging to 606 taxa (species or cultivars). In the world there are about 960 species of the genus Rhododendron. The highest species diversity is found in the Himalayas from Uttarakhand, Nepal and Sikkim to Yunnan and Sichuan. Many species and cultivars of the genus Rhododendron are noted for their many clusters of large flowers, and used extensively as ornamental plants in landscaping in many parts of the world. Many species of Rhododendron have showy flowers, but some species of rhododendron are poisonous to grazing animals because of a toxin called grayanotoxin in their pollen and nectar. People have been known to become ill from eating honey made by bees feeding on rhododendron and azalea flowers. 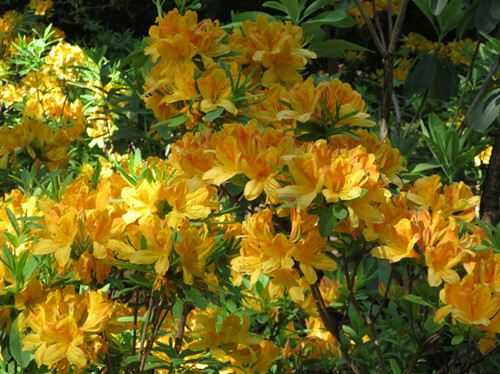 In the film “Sherlock Holmes” and in the episode of "Royal Pains" there were some descriptions on rhododendron toxin. The species Rhododendron molle (羊踯躅) is a most famous plant for its poisonous flower, which native to China and Japan, where it grows at altitudes near sea level to 2500 meters. It is a shrub that grows to 0.5–2 m in height, with leaves that are oblong to oblong-lanceolate, 5~11 by 1.5~3.5 cm in size. Flowers are yellow with dark red flecks. It got its Chinese name by goats happen to eat the plant then staggering to fall down. Symptoms of people wrongly overdose can cause vomiting, diarrhea, abdominal pain, cramps, slowed heart rate, blood pressure and breathing difficulties, severely it can cause respiratory arrest and death. Production of fruit could be used as analgesics, anesthetics. Although most of Rhododendron flowers are toxic, there are still a few flowers of Rhododendron, after some special treatment, becoming a delicious dish. 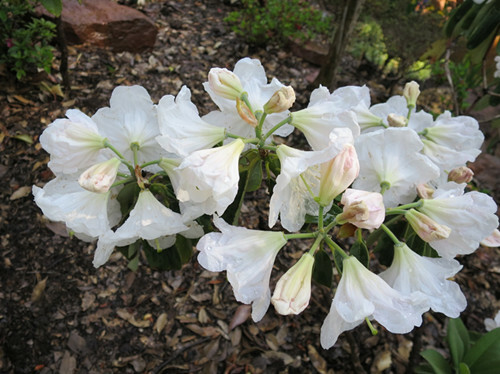 The species of Rhododendron decorum (called Big White Flower in Chinese) is a representative of eating flower culture of Dali Bai people who has a folk proverb "eat big white flowers in spring, no medicine needs in the whole year". Bai people through unique processing procedures, the white flower petals cook with bacon or ham, or as soup with broad beans, etc., tasted very delicious. This species is native to Myanmar and Guizhou, Sichuan, Xizang, and Yunnan of China, where it grows at altitudes of 1000–3300 meters. It is a shrub or small tree that grows to 1~7m in height, with leathery leaves that are oblong, oblong-ovate or oblong-elliptic, its flowers are white to pale pink.